We have had a few rainy days. A few touches of frost. My container plants started to wither. I got out my cozy sweaters. I was ready. This time of year is usually wet and gray around here. But summer has made a return of sorts. Sun-filled warm days, not a cloud in the sky. I folded up my cozy sweaters. The interesting thing has been the bees. I thought they would also fold up and hunker down in their hives. No sign of that yet. In fact, they seem busier than ever. This motivated me to coax my flowers back to life as much as possible since there isn’t a lot going for bees here at this time of year. This petunia is a little tired, but the bees are still happy to visit. For the first time in 20+ years, I noticed a bunch of hives up on the hill. This is wonderful, but we live in an arid area with not a lot of ‘pollen opportunities’ in August-October. Beep beep! Bees lining up for what’s left of the flowers. Bees also need lots of water. This became very apparent when we had a well pipe rupture this summer. The damp sod attracted lots of bees. Bees drown quite easily in water, but I wanted to help them. So I filled a shallow tray with rocks and let the hose drip. The bees loved it. Bees belly up to the watering tray. Then they called in their bee friends. Now the bee water trough and my entire deck are buzzing. The flowers are, thankfully, going crazy again in this warm weather along with some fertilizer. 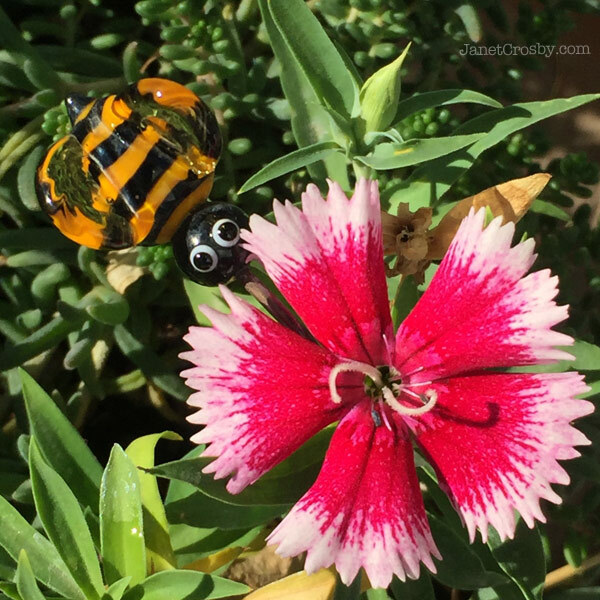 A bee is diving into this fresh petunia bloom. I am loving all of the bees! The buzzing is something else. And wow — they are thirsty. They are quite… curious? friendly? Buzzing all around, no stinging or bad behavior. So far, at least. Real bee on a glass bee in my garden. I posted a couple of clips on my Instagram page to show the bees buzzing flowers and drinking from their bee water trough. Click arrow on the right of the photo to see the videos. I love bees, but I am not a beekeeper. Here are some articles by a beekeeper with good info about water and flowers for bees. Next post: Catch A Wave!